Replacement: None. 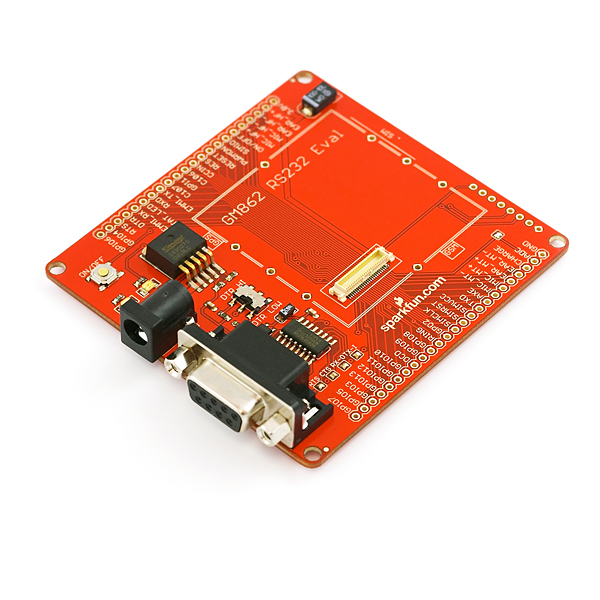 We've retired the GM862 module so it's time to discontinue the evaluation board as well. This page is for reference only. The GM862 RS232 EVK is a standard serial based 50-pin breakout board with external power. This allows connections to the audio, digital, and camera interfaces on the GM862 module. The GM862 RS232 EVK attaches to any RS232 system. Power up the board, turn on the module, and you can start sending and receiving AT commands via HyperTerminal. No messy 3.8V regulation. No tricky 3.3V to RS232 level converter. It's all done for you! 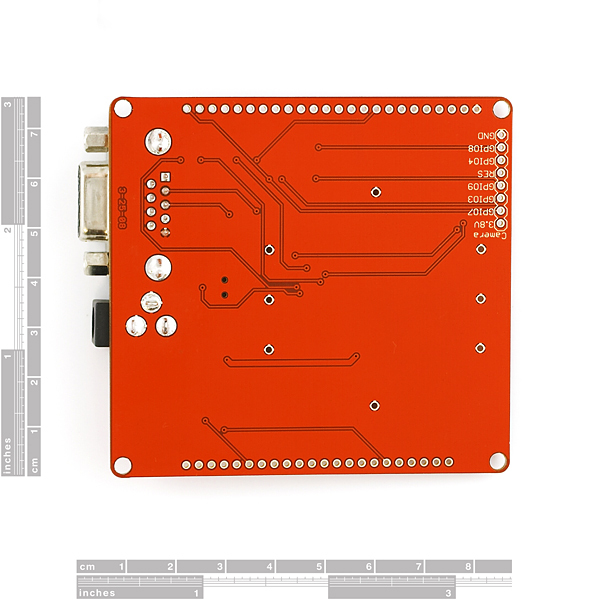 The board comes fully assembled with 50 pin Molex connector part # : 53748-0504, 3.8V power regulation circuitry, and supporting circuitry. The Molex connector is brought out to 2 single row, .1" headers. 3.8V is regulated through a surface mount LDO regulator with 400uA quiescent current. This is all new to me, using GSM cell phone technology to directly control I/O at the 'other end', the receiving end. In attempting to under stand a couple of the Sparkfun modules, I am not clear on what the originating call does after dialing and connecting to the module. I am thinking that the originating call phone would have to have some sort of 'app' that sends out what ever is expected at the receiving end (?). Or, is it just sending out keypad data which I would think would be DTMF tones at the receive end(?). I notice that there are several GPIO pins on the GSM chip. So that means that the GSM must be programmed on using the received communication in order to activate the desired GPIO(?). This seems similar to using the Xbee modules. A friend wants to use cell phone technology to connect to a remote cell phone and be able to activate the outputs. I am thinking that I would use these outputs as discreet (digital) inputs to a small PLC and then have the PLC do the external control functions. I can also use the Atmel AVR devices to configure and program the AVR board (Olimex) to control the external I/O at the remote end. Am I too far off base in using the GSM modules such as sold here at Sparkfun ? 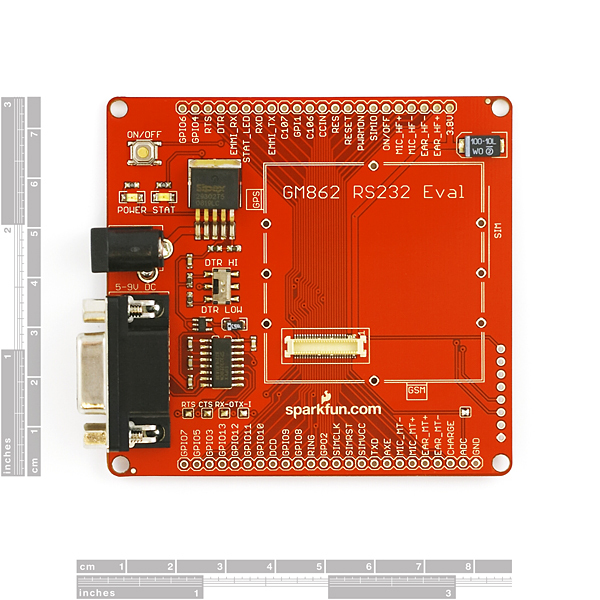 GM862 Evaluation Board - RS232 , this is the product I was looking at. Can I use 12 volts DC power supply here when the GM862 is attached on the board? This is a nice board but i don't see how this can cost 75 bucks. I mean a 8 dollar reg, the barrel and serial connectors and the buttons and LED's and everything on the board. The only thing i can think of is that that IC cost about 50 bucks. No problems at all fitting the antenna as per another poster. Fitted a GM862-GPS module; downloaded my Python GPS/SMS script and away she goes!!! I bought one of these boards, but I have a major complaint about the position of the voltage regulator : it's TOO close to the GPS antenna connector. I had to file off the edges of the regulator so i could sit the module correctly with the gps antenna installed. I used a normal MMCX antenna with 90 degree connector, same size as the SMA to MMCX converter cable, so I can't say the antenna was too bulky. You mght want to take this into consideration in the new version, if any. I was just about to order this. Any idea when it will come back into stock?